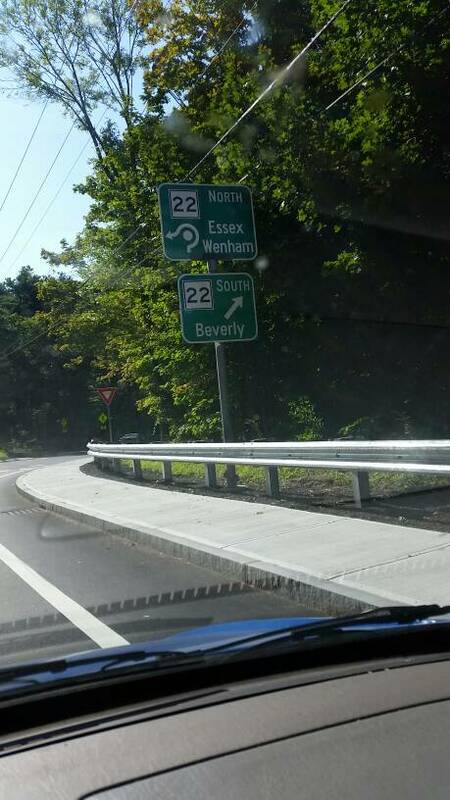 Drove through the new roundabout in Beverly at exit 18 (MA128 @ MA22). Overall it's easier to make that left onto 22 North. Not sure how I feel about the paddle signs though. Interestingly this project was fully funded by the city, as they wanted to get it done as soon as possible. The D6 (paddle) sign (for northbound 22) lists the control cities in the incorrect order. One encounters Wenham first, then Essex... with Hamilton in between. IMHO, there's certainly room on that panel to do the Wenham/Essex combo. Either that or MassDOT could've just stuck with the traditional (for this location) single listing for Essex. I recall when the DCR was created some of the old MDC roads were transferred to MassDOT. Is there a good source of info on which? The MassDOT roads shapefile says MassDOT owns Route 16 in Medford, but some locals say this isn't the case. The transfer of Route 16 from DCR to MassDOT is fairly recent, and may still be in process AFAIK. And most of the old MDC roads are still under DCR jurisdiction - it's only snow removal and other maintenance on the major parkways (Storrow Drive, Soldiers Field Road, VFW Parkway for examples) that has been transferred to MassDOT. This change occurred shortly after a winter where some pedestrians were struck by cars - they were forced to walk in the road because the sidewalks hadn't been cleared. Recent as in this year? I should clarify that I’m talking about the part west of 93. Sometimes I forget about the fact that 16 runs all the way past Wellington east of 93. Many mapping programs still (erroneously) refer to Mashapaug Rd as Route 15. Even the Pilot station along that road (reachable by Exit 1 off I-84 in Sturbridge, MA) lists its address on credit card receipts as Route 15. I should clarify that Im talking about the part west of 93. Sometimes I forget about the fact that 16 runs all the way past Wellington east of 93. Yes for both this year and the part west of 93. Apologies if this was posted in a thread I didn't see, but I figured some might be interested in this Berkshire Eagle editorial about US 20. Unlike Route 66, US 20 is still an ACTIVE designation. Designating it as a "National Historic Highway" is just more political BS this country doesn't need. I guess everything is political if you look at it the right way, but is tourism and economic development really that bad? Point taken. However, perhaps the people promoting this idea should present some realistic projections about the increased tourism and economic development before they force DOTs to rush headlong into providing signs for them. And the other question is this: How many other designations (Scenic Byway, Heritage Trail, etc.) do the various sections of US 20 in different states have? But let's plop down even more signs - again, on a ACTIVE US Route that will only serve to distract drivers and create future maintenance headaches for local communities and state DOTs. Plus, the whole premise that US 20 can suddenly become the next Route 66, in my opinion, demonstrates how the folks promoting this haven't really thought it through. Route 66 became iconic both for being featured in popular culture since the Great Depression, and also as a symbol of how the Interstate system radically changed the country, and not for the better in several ways. US 20 doesn't have, and never will have, that pedigree or aura no matter how many signs you put up. I take it you're not attending the Mentor road meet, then. I’ll bet they can pull some tourists down 20 with the right campaign. People now go to Pittsfield for fun, so anything is possible. And I’ll bet that even without an official designation the concept will gain traction. Western Mass. in general is bigger draw now than I recall it ever being. I have a history question. Where was the original southern terminus of MA 3? I've seen it mapped to end at Scusset Beach, then again it was taken down Sandwich Road (the road on the cape side of the Canal.) to end at the Bourne Rotary. The north end of the old Sagamore Bridge, where Canal Street now ends at Gibbs Road. By the way, the bypass on Gibbs Road/Swift Road was laid out in 1931, leaving behind Old Plymouth Road. Memory Lane: Driving through Boston video circa 1976 via the old South Station Tunnel, Central Artery, Tobin Bridge, Northeast Expressway along with another section of US 1 in S. Lynnfield. Note some of the old BGS'; pay close attention around 0:45-48 for a then-recently obsolete route designation). I know that's part of US Route 1 now. One of those ghost ramps still exist today. Weird seeing no car dealership by the Lynnfield tunnel or the movie theater complex in Revere! I know that's part of US Route 1 now. One of those ghost ramps still exist today. Actually, both bridges that were to connect I-95 with the sand fill over the Rumney Marsh (since removed), one for I-95 NB and one for I-95 SB, are still in place. Before the signs in this area were replaced in 1998, there was also a sign gantry in Copeland Circle just before the I-95 NB bridge, as well as an unfinished ramp connecting the Copeland Circle (MA 60 under US 1) roadway to the NB I-95 alignment. Copeland Circle...the rotary near the aforementioned movie theater for MA Route 60? A CCL bus took that as an altetnate a couple times, heading to MA Route 1A South towards the Logan Airport area and the beginning of I-90 West (via TW Tunnel to South Station). Copeland Circle...the rotary near the aforementioned movie theater for MA Route 60? Yes. Have amended my post. US 1 was rerouted and signed along the Tobin Bridge & Northeast Expressway (both of which were formerly I-95) circa 1975. At the same time, I-95, I-93 (extension) & MA 1A (extension) were placed/rerouted to their current corridors. The eastern end of MA 60 was rerouted away from Revere St. and onto the lower-portion of the American Legion Highway (former-US 1) to MA 1A/16 at Bell Circle circa 1978. Assuming that 1976 date of that video is correct, that Chelsea/Revere pull-through BGS obviously didn't get its US 1 shield the same time the other ones at the I-93 split were changed (from I-95 to US 1). I'm not surprised. I remember the structure-mounted BGS (along the Central Artery viaduct) for the Callahan Tunnel got its route shield changed (from US 1 to MA 1A) a tad late in the game as well. Used to possess an older (seventies) spiral bound Boston area road map. The dashed double lines of the marsh alignment were clearly shown. Right up to the southern fringe of Lynn. Don't believe any structures in either Lynn or Peabody were demolished for the 95 alignment, it was cancelled before that could happen. Lynn incidentally was a leader in arson fires for a while - late seventies/early eighties, as owners likely gave up on their aging three decker wood frame homes. The video was really neat thanks for posting. The 1976 date seems correct, a big bumper Maverick (73 up) and an AMC Matador are prominent. No downsized GM metric midsizes visible, which debuted in fall of 1977. And a Datsun Z car. Interesting they were using formed Jersey barriers (CBR's) already, as seen in the US 1 median upgrades. Was in a friends' parents brand new Saab 900 (mid eighties) on that Storrow Drive off ramp (near the old Boston Garden) and he almost put that car into the side rails showing off. The video was really neat thanks for posting. You're welcome. I found it on a Facebook post earlier this morning. The 1976 date seems correct, a big bumper Maverick (73 up) and an AMC Matador are prominent. No downsized GM metric midsizes visible, which debuted in fall of 1977. And a Datsun Z car. My questioning of the 1976 date was under the thought that the video may have been filmed a year or two earlier (1974-1975); given the 95 NORTH Chelsea-Revere pull-through BGS. I didn't get a chance to view the video more closely (I was pressed for time) to identify the newest car(s) in it. Yes usually date old pictures or videos by the cars in them. A year or two earlier - certainly possible. Believe that grimy overhead BGS with the tiny I-95 shield under the upper deck - survived later than the mid seventies. It was likely forgotten, it was there, for a good while. There was still a tiny I-95 shield above the road northbound in Chelsea. At the base of the last off ramp as the bridge steel was ending. Possibly into the 2000s. It disappeared no earlier than 2002, because I saw it.